From the Vendor: This yellow Borneo strain comes from a Red Vein borneo leaf that’s dried differently, farmers use old leaves and an ancient, more complicated drying process to achieve a yellow vein borneo strain. And the result is that yellow strains have their own very unique aroma compared to red, white or green borneo Kratom. This new drying method causes the vein to turn yellow and slightly alters the alkaloids in the leaf. First time using this strain, so far have not gotten the desired effects as listed in the description. Maybe get need to dose adjusted. Packing and shipping was great. I never even tried the Yellow Vein Kratom until five or six months ago. Up until that time my favorites were Red Vein, red Malay and Green Maeng DA. I finally tried the Yellow Vein capsules and was pleased at the mellow, stimulant effect it had on me. I then tried the Yellow Vein Powder and have become it’s number #1 fan. The Yellow Vein helped me withdraw from Tramadol which I was prescribed for shoulder pain. 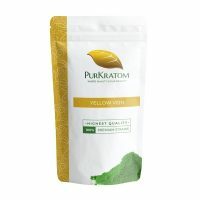 Yellow Vein is the mellowest, smoothest, Kratom ever. I love it!!! I have fibromyalgia. This product seemed to help with pain and energy levels. The package says to only take two grams per day, but I found I needed about 3 grams a few times a day, but it did seem to help. I’m just at a loss as to all of the bad publicity surrounding Kratom. It seems like a good natural way to help with pain relief and energy levels.